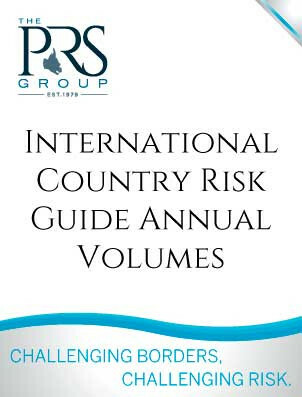 Purchase individual volumes of the International Country Risk Guide Annual (described separately). Choose from seven perfect-bound volumes (6 regional volumes and one volume of country risk ratings & statistics extracted from ICRG over the previous year). The countries included in each region are listed as "More Info" by each volume below. The volumes are available only in print at this time. Shipping/handling fees are based on delivery destination (selections below). Appropriate sales tax also applies. NOTE: The full set of seven volumes is also available (see ICRG Annual).